I found this recipe a few weeks ago on pinterest. This is easy to make and sure to impress! You can serve this as a meal with the chicken sausage, grilled chicken, or shrimp, or you can serve it minus the protein as a side dish. Either way this pasta dish is sure to be a hit with your whole family. This is for little ones ready for finger food. Remember to cut your little one's portion up into bite size pieces. You can find this recipe and other yummy recipes here. 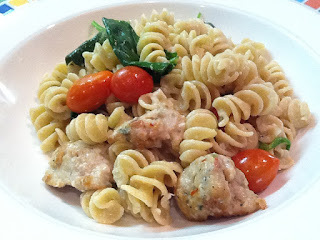 The only things I substituted from the original recipe is whole wheat pasta, and regular milk instead of heavy cream. Enjoy! I made this tonight and it was absolutely delicious!!!!! Have tried a couple of your recipes and they are always spot on – this one is my favourite so far!